Will Dr. Elizabeth McCord win her fight to balance work and family? Has the Madam Secretary TV show been cancelled or renewed for a fourth season on CBS? 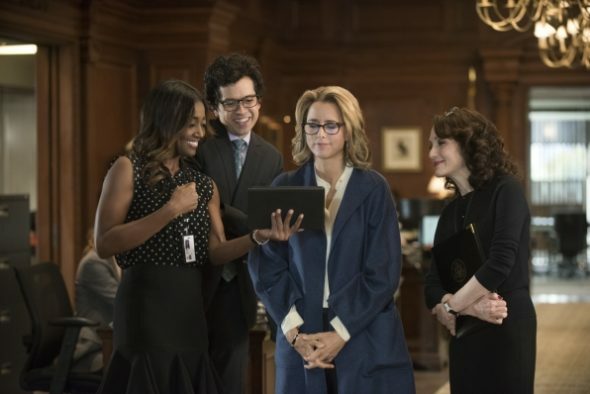 The television vulture is watching for TV cancellation and renewal news, so this page is a dedicated place to track the status of Madam Secretary season four. Bookmark it, or subscribe for the latest updates. Remember, the television vulture is watching your shows. Are you? A political drama airing on the CBS television network, Madam Secretary follows the shrewd, determined Elizabeth McCord (Téa Leoni). As U.S. Secretary of State, she battles office politics, while driving international diplomacy and negotiating global deals. She also handles domestic issues — both at the White House and at home. A college professor, Elizabeth was once a CIA analyst, who left her post for ethical reasons. She returned to public life at the request of President Conrad Dalton (Keith Carradine), following the death of her predecessor, Vincent Marsh (Brian Stokes Mitchell). President Dalton values Secretary McCord’s apolitical leanings, knowledge of the Middle East, flair for languages, and unconventional thinking. The cast also includes Tim Daly, Bebe Neuwirth, Željko Ivanek, Sebastian Areclus, Patina Miller, Geoffrey Arend, Erich Bergen, Kathrine Herzer, Wallis Currie-Wood, and Evan Roe. The third season of Madam Secretary is averaging a 0.89 rating in the 18-49 demographic and 8.32 million viewers. Compared to season two, it is down by 26% in the demo and down by 18% in total viewers. Find out how Madam Secretary stacks up against the other CBS TV shows. On March 23, 2017, Madam Secretary was renewed for a fourth season. It will debut on October 8, 2017 at 10pm. Although Madam Secretary season three routinely draws a sizable audience for CBS, its average in the coveted 18-49 year old demo — which has never been impressive — continues to decline. However, the show’s total viewership is still healthy. I expect CBS will renew Madam Secretary for a fourth season, thereby ensuring it a decent syndication package. Syndication is where the big money is and, after all, television is a business. 3/23 update: Madam Secretary has been renewed for season four on CBS. Details here. What do you think? Are you happy the Madam Secretary TV show was renewed for a fourth season? How would you feel if CBS had cancelled this TV show, instead?